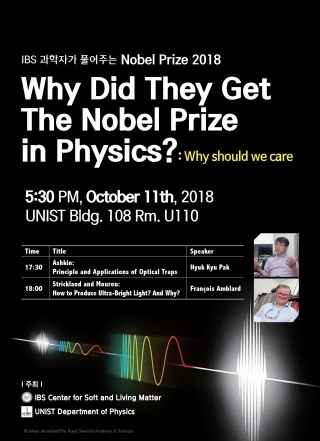 A special lecture on the 2018 Nobel Prize announcement in Physics is scheduled to be held in Natural Science Building(108) at UNIST. Organized by UNIST and the IBS Center for Soft and Living Matters, the event invites Professor Hyuk Kyu Pak and Distinguished Professor François Amblard to hear their insights into the latest winners of the Nobel Prize in Physics and their accomplishments. Here, attendees will have ample opportunity to interact with lecturers and learn more about Optical Tweezers and High-Intensity Laser. Topic: Why They Get the Nobel Prize in Physics? And Should We Care?